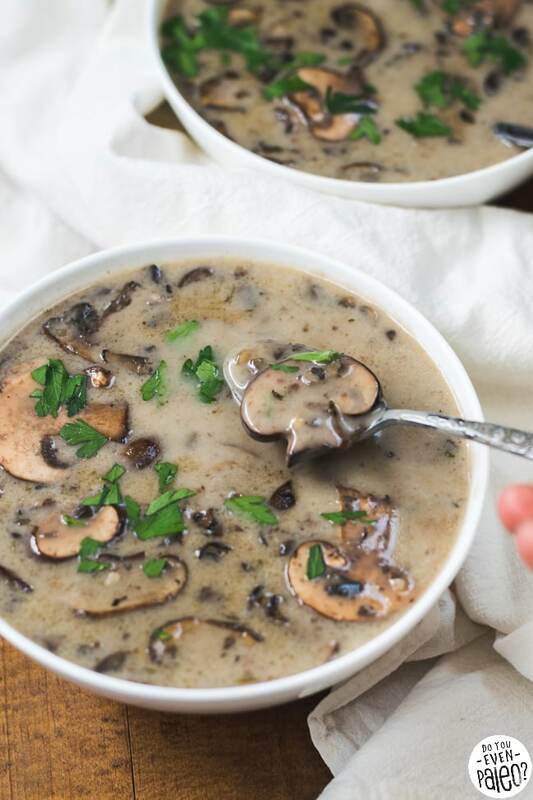 If you grew up with cream of mushroom soup in a can (like me), making your own mushroom soup might seem incredibly daunting. 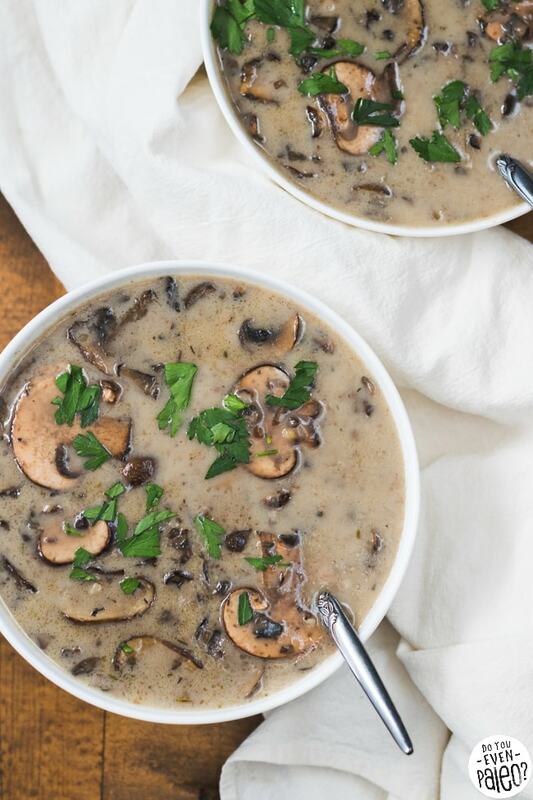 But trust me, this Creamy Garlic Mushroom Soup is one of the easiest from-scratch recipes on the web. I sincerely doubted I could make a mushroom soup that rivaled the cream of mushroom I used to eat voraciously as a kid. No joke—I could pop that can open and eat the cold gelatinous insides with a spoon and somehow find enjoyment in it. Well, this soup isn’t quite like that. I wasn’t aiming to make an exact replica. 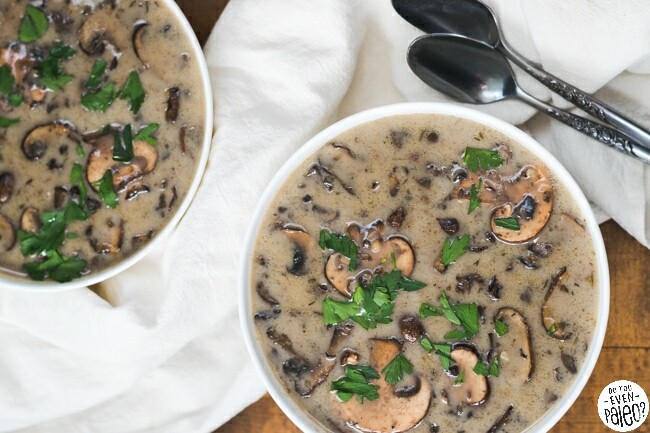 Instead, this is what mushroom soup should be. Wholesome, flavorful, rustic. And full. Of. Mushrooms! Mushrooms are without a doubt one of my favorite ingredients. I definitely don’t take the time to use them in enough dishes! Yes, I do have a few hits like my Mushroom, Bacon, and Cauliflower Casserole, but that’s just scratching the surface. Mushrooms have a lot more to offer, so I’ve tried to bring them into my kitchen a little more often this fall. 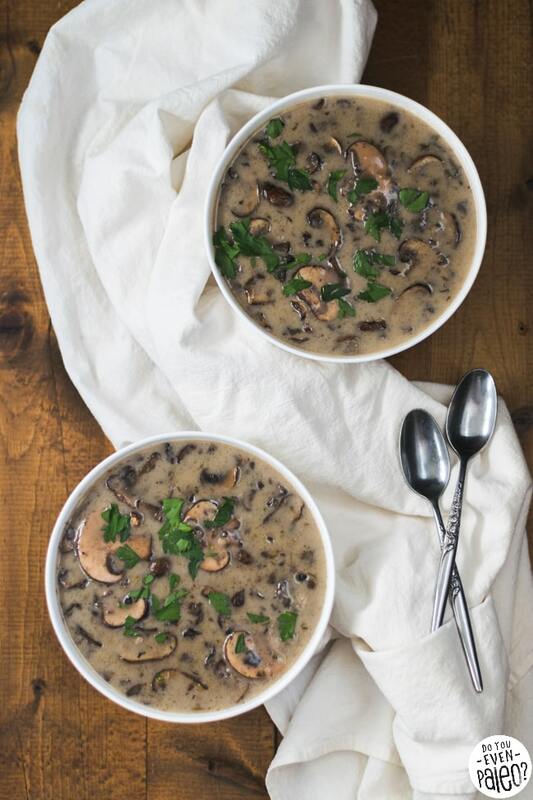 And why not use them in a classic dish—mushroom soup? My dairy free version is quick and easy. And to add my own little flair, I amped it up with some extra garlic. Because that rustic, bold flavor of garlic just seems perfect this time of year. 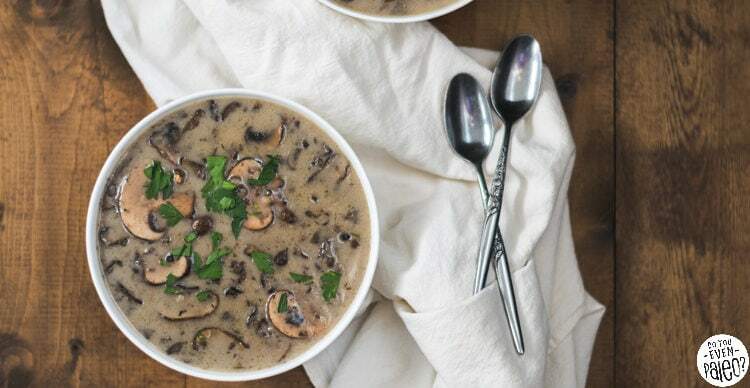 Wondering what magic makes this dairy free soup creamy? It’s just a bit of coconut milk. Again, not as creamy as if you used a heavy dose of cream, but just enough so you aren’t slurping pure broth. The weeks between Thanksgiving and December holidays are perfect for a recipe like this. It’s not very gut-busting. Pair it with a protein and you’re good to go! I, for one, like lighter fare between the food festivities of the holidays. Although I rarely overeat in a single sitting, I’ve been known to start my day with a slice of leftover pie for days on end. Nothing wrong with that, of course, but I feel a little more stable when I balance that with lighter, healthier foods later in the day. Like mushrooms! It all comes back to mushrooms. Let’s get down to it. 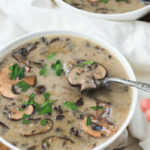 If you make this mushroom soup, tell me what you think of it! I’m @doyouevenpaleo everywhere on social media. Wash the mushrooms clean and let them dry. Slice them thinly, then roughly chop half of the sliced mushrooms. Heat the olive oil in a deep pot over medium heat. Add the mushrooms, garlic, black pepper, and sea salt. Saute for about 10 minutes, until the mushrooms have released their mushrooms and all the liquid has evaporated. Add the ghee and arrowroot flour to the pot. It will form a thick paste. Stir to coat the mushroom mixture. Cook for 1 to 2 minutes, until the arrowroot flour browns a bit (but don’t let it burn). Slowly pour the broth into the pot while stirring constantly. Repeat with the water. Finally, add the dried thyme. Let the soup come to a simmer, and cook for about 5 minutes or until the liquid has reached desired thickness. Once the soup has thickened to your liking, add the coconut milk and stir to combine. Serve immediately or store for up to a week. Garnish with chopped parsley or fresh thyme if desired. 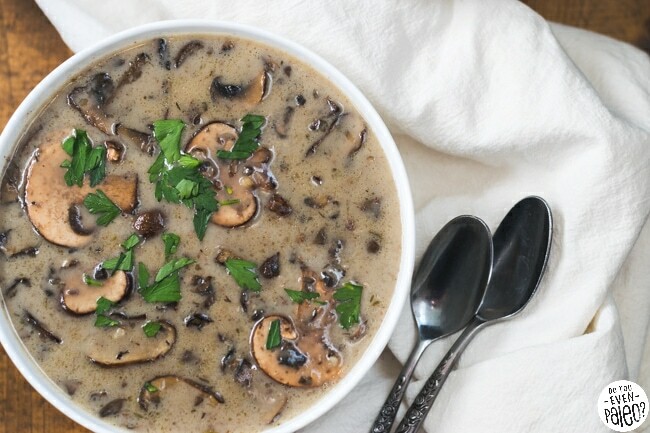 I love soup and with mushrooms is the perfect combination. I believe there’s nothing like a homemade dish or soup for this matter. Thanks for sharing this delight. Don't subscribe All Replies to my comments Notify me of followup comments via e-mail. You can also <a href='https://www.doyouevenpaleo.net/comment-subscriptions/?srp=3038&srk=87505361eee98908ddf6ccb8681f50d6&sra=s&srsrc=f'>subscribe</a> without commenting.